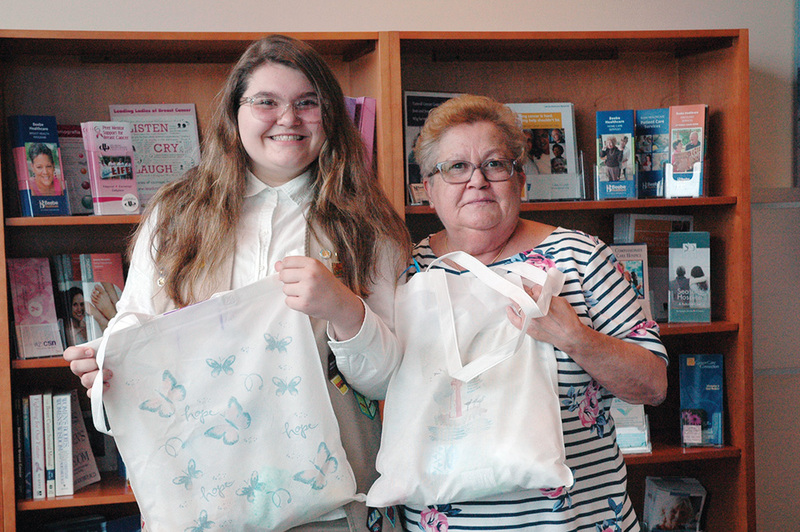 Mickayla Austin, left, appears with her grandmother MaryAnn Matyjewicz, right, a breast-cancer survivor who also served as Austin’s mentor for her Girl Scout Silver Award project. Beebe Healthcare’s Tunnell Cancer Center recently received 24 “hope bags” from local 14-year-old Girl Scout Cadette Mickayla Austin. The hope bags were part of Austin’s project for the Girl Scout Silver Award — the highest award a Girl Scout Cadette can earn. Austin, an incoming freshman in high school, made 24 bags — 12 for women and 12 for men. Her project included hand-stamping designs on the bags, hand-written cards with inspirational quotes, and an introduction of herself and her project. The bags also include items inside for the patient to feel comfortable at their cancer appointment, such as hand lotions, crackers, hard candies, word-search book and socks. Austin is an independently registered Girl Scout (Juliette) who has been scouting for 10 years. She has been working with Girl Scout troops 858/958, run by Girl Scout Troop Leader Tanya Sykes, to earn her Leadership in Action (LiA) Award patch. Austin called upon the troops to fill the hope bags, which is one of the requirements of the Silver Award Project. She also completed her Program Aide leadership training, which she can use to teach the younger Girl Scouts. “We are so grateful for Mickayla’s hard work on her donated hope bags and the fact she chose Tunnell Cancer Center as the focus on her Silver Award project; Mickayla is a wonderful role model to other youth in our community. Our patients truly appreciate these personal touches and knowing others in the community care,” said Lisa Henderson, RN, OCN, oncology nursing manager at Beebe Healthcare’s Tunnell Cancer Center. Girl Scout Award projects are intended to remain sustainable within her community, so the community can donate Hope Bags as well. Anyone wishing to donate items for additional hope bags or assist in creating new bags can contact Carol Hunt, oncology service line coordinator, at Tunnell Cancer Center, at (302) 645-3171. Austin is also involved in FFA at school and received her Girl Scout Silver Torch Award pin for holding the FFA treasurer position this past year. This coming school year, she will move into being an Ambassador Girl Scout and planning her Gold Award. She is working toward her goal of using her Girl Scout leadership training to pursue her path of becoming a Sussex County school teacher.